Huguette Clark, born near the beginning of the 20th century, was the daughter of the nation’s second richest man and grew up in luxury. She was a lively and social philantropist who relatives one day realized had become gradually more distant until she virtually disappeared. What happened to this once vibrant personality? The Phantom of Fifth Avenue: The Mysterious Life and Scandalous Death of Heiress Huguette Clark is an infuriating read. It is a dispassionate account of this life of Huguette Clark and what happened to her once she went into isolation written by journalist, Meryl Gordon. What is infuriating about the book is the connection that Gordon builds between her subject and reader and then the revelation that she was basically a tool for gain in her latter years outlined in objective fashion that could not make clearer the motivations of the century old woman’s carers. Before reading The Phantom of Fifth Avenue: The Mysterious Life and Scandalous Death of Heiress Huguette Clark, I had not heard of the lively Senator from Montana, William A. Clark. He and his first wife, Katherine, had seven children before her death in 1893. After Katherine’s death, William married his teenaged ward, Anna, with whom he had two children, the youngest of which was Huguette. Gordon’s account of Clark’s early life and the lives of her parents are through and when she embarks on the latter chapters of Clark’s life relies on interviews with key players who seem to have been surprisingly open with the journalist along with court documents that chronicled the struggle between the heiress’ family and the people paid to care for her. Clark lays out in a linear fashion the relationship of Huguette and her parents, the loss of her older, adored sibling and her relationship with her remaining and much older half-siblings with whom she was distant and cordial. Huguette’s mother, by all accounts, was a colorful woman who reveled in her daughter and indulged her while making clear that she was in this life on her own. A brief marriage that went bad cut through the middle of Huguette’s isolated existence. The sign of a really good book was when the back cover is closed, the reader heads to Amazon and buys everything the author has written and that is truly what happened in this case. The Phantom of Fifth Avenue: The Mysterious Life and Scandalous Death of Heiress Huguette Clark is confounding. Huguette’s relatives had a relationship of routine and it took them coming together to realize that no one had heard from her. How she wound up in the hands of people who seem to have had genuine affection for her but were eager to use her to their advantage isn’t a perplexing mystery. She was grateful for their attention. The e-mails that flew between the hospital higher ups and their fundraising department is beyond shameful. Huguette may have preferred living in the hospital with her precious nurse and seemed quite aware that the all hour dedication she gained was contingent on making the woman very wealthy. The Phantom of Fifth Avenue: The Mysterious Life and Scandalous Death of Heiress Huguette Clark is really a story of morality. People knew what was going on with Huguette and her carers and looked the other way. Did they believe the woman was better off or did they look for their own payday? You make the call. I will tell you that I was furious when I finished reading this book. I become so engaged with Huguette and her story and the steps that led her to be the woman who would pay – and pay dearly – for company was just heart breaking. The Phantom of Fifth Avenue: The Mysterious Life and Scandalous Death of Heiress Huguette Clark is a must read. Seriously, pick it up today. 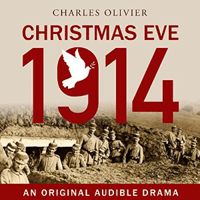 Written to commemorate the 100th anniversary of the Christmas Truce, [easyazon_link asin=”B00R2D5T9U” locale=”US” new_window=”default” nofollow=”default” tag=”rabidreaders-20″]Christmas Eve, 1914[/easyazon_link] is a story of soldiers on the Western Front. A story of men sent to fight far from home anticipating the end of war and not realizing that hostility has just begun. One day that an unofficial truce was called and British and German soldiers exchanged holiday greetings.